Freshly washed carrots from the farmers market. 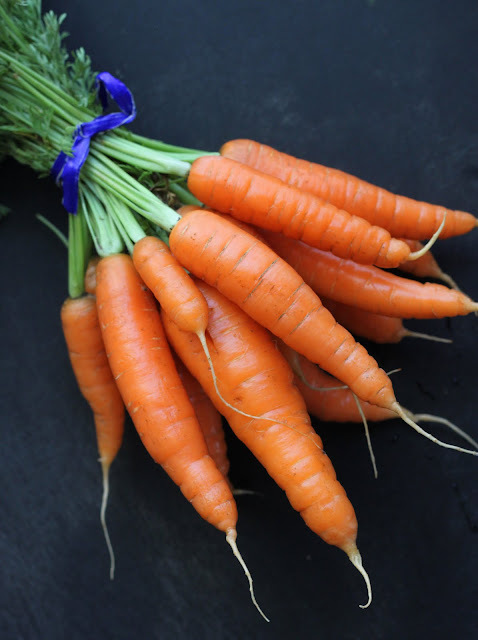 The carrots from the farmers market even taste better - they have a sweeter and more grassy taste, whereas I think the carrots from the grocery store just taste a little watery and dull. And speaking of watery, it is funny how those plastic wrapped carrots are packed in water, but yet can be so dry. The carrots from the farmers market are always fresh and full of life. And if you like a little variety in your life, look no further than the farmers market to find red, purple, and yellow carrots. The carrots from the farmers market come in all sizes... including some mini ones. Sometimes when I get these carrots I just bring them home and eat them raw with an easy veggie dip, or I slice them up for salads or slaws. But recently, I have been really into roasting them with spices to enhance their sweet flavor. No need to peel them, these carrots are perfect and beautiful just sliced in half. So for these spice roasted carrots, I decided to mix sweet and salty with a rich spice blend known as baharat. Baharat is a Middle Eastern spice blend commonly used to season lamb, lentils, stews, and soups and there are several different varieties. The one originating in Turkey also contains mint, but the most traditional Arabic or North African baharat spice blend contains black pepper, coriander, cloves, cassia bark, cumin, cardamom, nutmeg, and allspice. 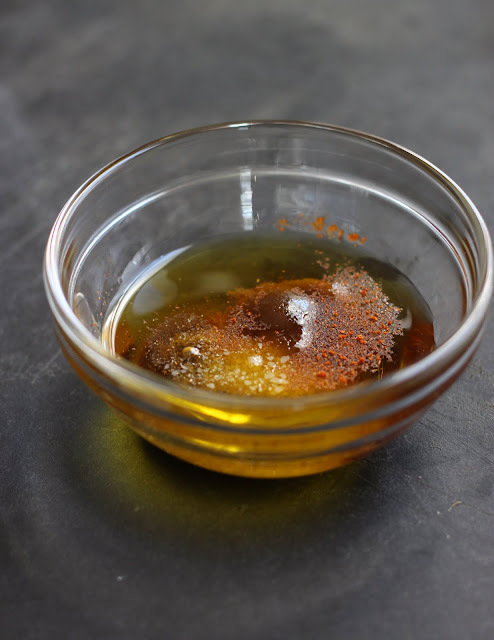 Some blends also include chili pepper or paprika to give them a bit more ‘heat,’ but mine doesn't so I added some extra cayenne pepper to this recipe. Olive oil with sugar, salt, and spices to glaze the carrots. ...and in 15 minutes you can have a great, healthy side dish for a weeknight meal. Obviously this is a recipe you could also make with large, bagged carrots from the grocery store, so that makes this an easy side for a weeknight meal; plus, the flavors are exotic and spicy, so it can shake up your normal everyday routine. However, I would argue this recipe will taste best with fresh-from-the-earth carrots, so pick them from your own garden, pick them from your neighbor's garden (after asking nicely, of course), or pick some up at your local farmers market. To find Baharat, check Whole Foods, order it from Amazon , or from fine spice purveyors online. Also, if you want to roast sweet potatoes with this spice blend, check out my recipe on Chef Marcus Sameulsson's site. *And just FYI, I sent this over to Get Grillin’ with Family Fresh Cooking and Cookin’ Canuck, sponsored by Ile de France Cheese, Rösle, Emile Henry, Rouxbe and ManPans. Check them out! You can imagine this spice blend would be great with lots of vegetables but those with natural sweetness like carrots and sweet potatoes are a natural fit. Try roasting halved onions too, or cauliflower florets. Depending on the size of your vegetables, watch the roasting time and toss them once during cooking. 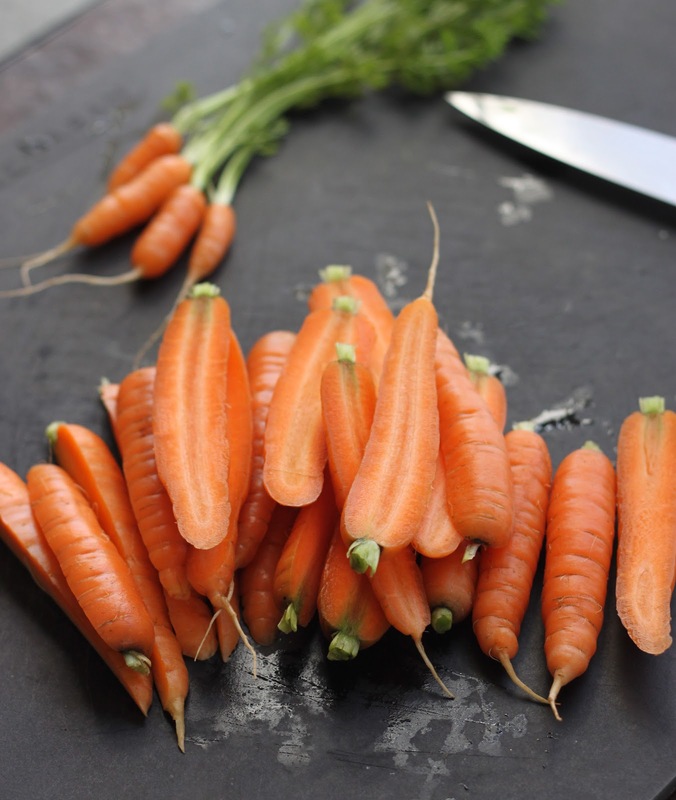 Prepare carrots by chopping off the leafy tops and rinsing them well. (If you like, peel them, but it is not necessary.) If the carrots are medium-sized, chop them in half length-wise, but if they are large cut them into length-wise quarters. If they are really long, cut them in half width-wise as well. Next, make the glaze by combining the remaining ingredients in a small bowl and whisking them together well. 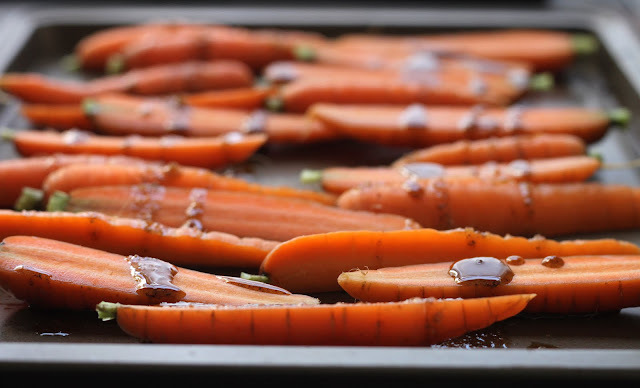 On a rimmed baking sheet, spread carrots evenly, then drizzle with the spice glaze. 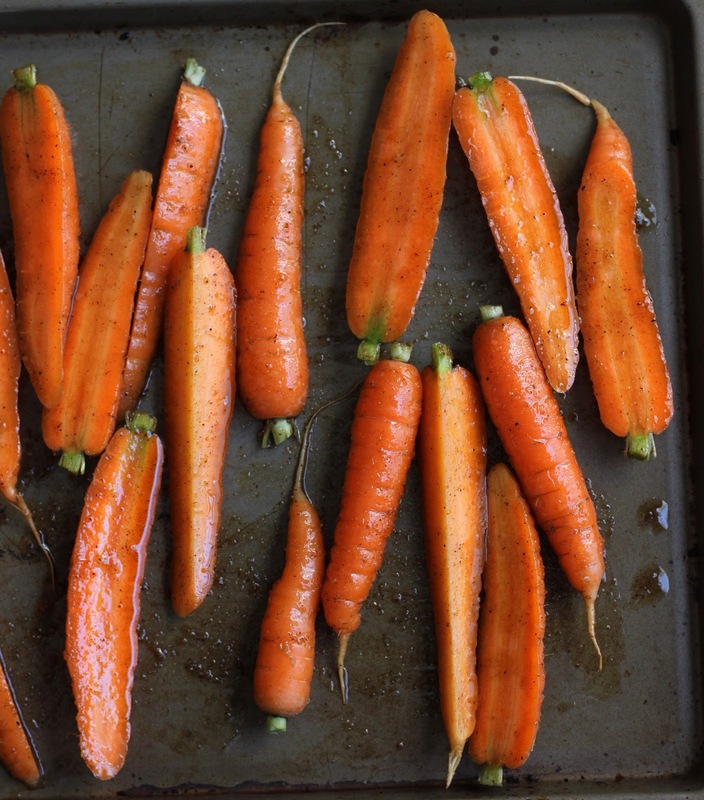 Using your hands or tongs, toss the carrots on the baking sheet until they are evenly coated with the glaze, then spread them out to roast them in a single layer. Roast them in a preheated oven for about 7-8 minutes, until they are fragrant and beginning to brown. Remove them from the oven, turn them over, and then return them to the oven to roast for an additional 7-8 minutes or until they are crispy and a dark caramel color. Remove from the oven and serve immediately. Baharat is a wonderful spice mix. 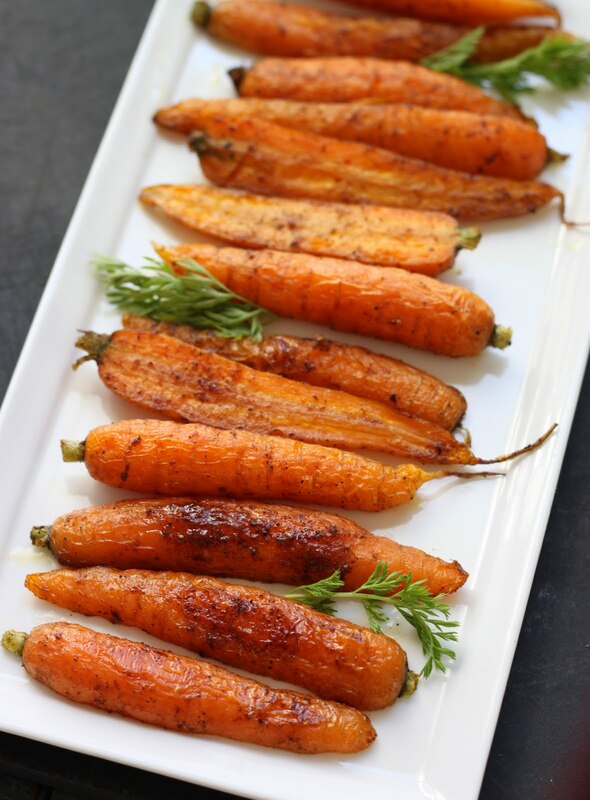 Your roasted carrots look heavenly! I love eating raw carrots with dips. so glad to see beautiful recipes using baharat! the stuff is in my blood and i'm always happy to see it being used on more than just lamb and rice. this is a beautiful, colorful and aromatic side dish. thanks for sharing! Carrot is one of my fav vegi and I like to eat it any way. This is one of my fav! These look wonderful! I made apricot-cayenne carrots for Christmas. The sweet and the spicy go together really nicely! 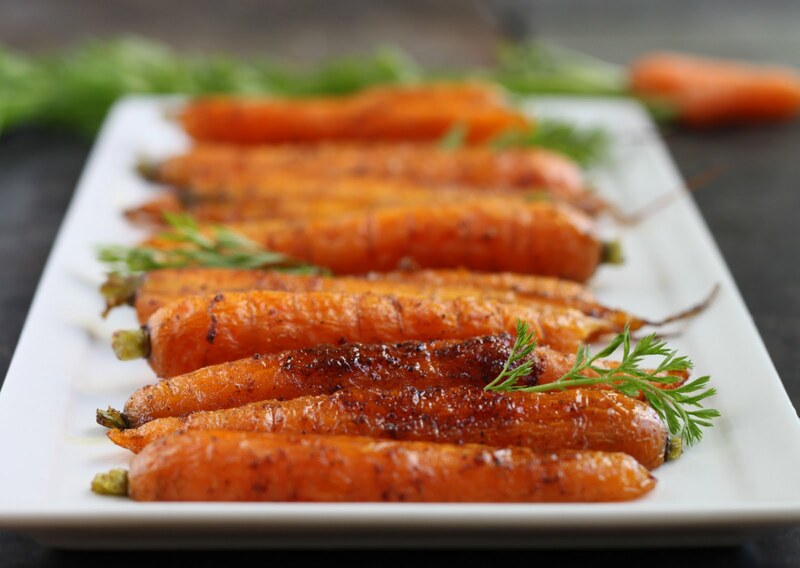 These must be so delicious: the natural sweetness of a caramelized carrot juxtaposed with the heat of the spice blend. Yum! I've never seen such beautiful carrots :) I have roasted just about every other vegetable I can think of, but never carrots...I'm definitely going to give this a try! Thanks for the introduction to that spice mix Amanda. These look beautiful and delicious! I will definitely be trying this soon. I tried doing some "roasted carrots" on the grill last night, and they turned out great, tossed in some ginger and honey! I would really like to get my hands on baharat to give that a try, too. 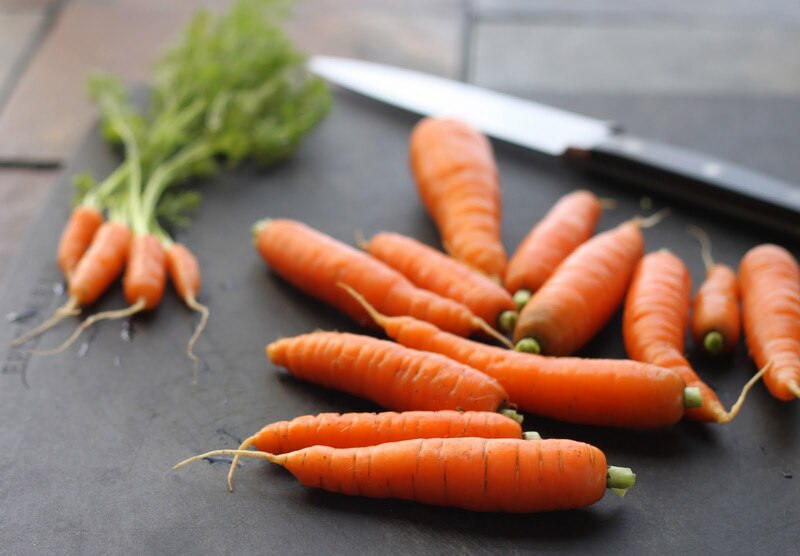 And yes, I was also wondering about the origins of baby carrots the other day as I chopped on some of the real deal... who needs cut and polished? I like that you didn't even feel a need to peel these! Hi Dear, These carrots are looking gorgeous. Bright pictures loaded with goodness of carrots, simply loved this recipe and didn't knew it was that simple to make. Loved the new combo of ingredients and the recipe is so nicely made and presented. Saving this recipe of urs and wud love to give ur version a try on the coming weekend. Have a great day….Sonia !!! Beautiful! I made something similar not too long ago and it was so good. 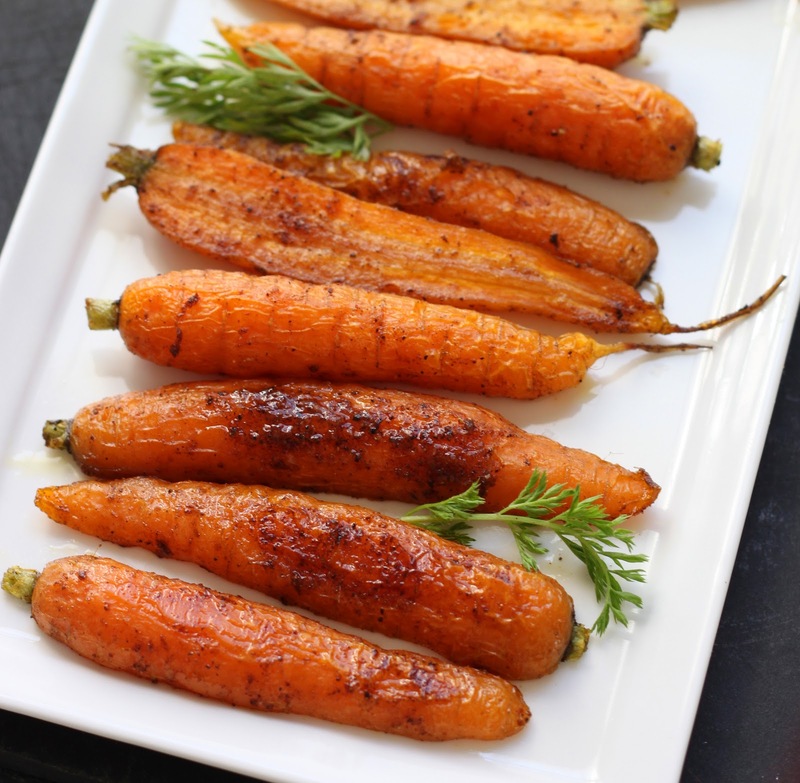 You've reminded me how simple and good roasted carrots can be. I don't know why I'd forgotten. I've got some fresh goats cheese in the fridge that would be just perfect with these babies. Great! Oh my goodness...those carrots are a work of art! What a color! 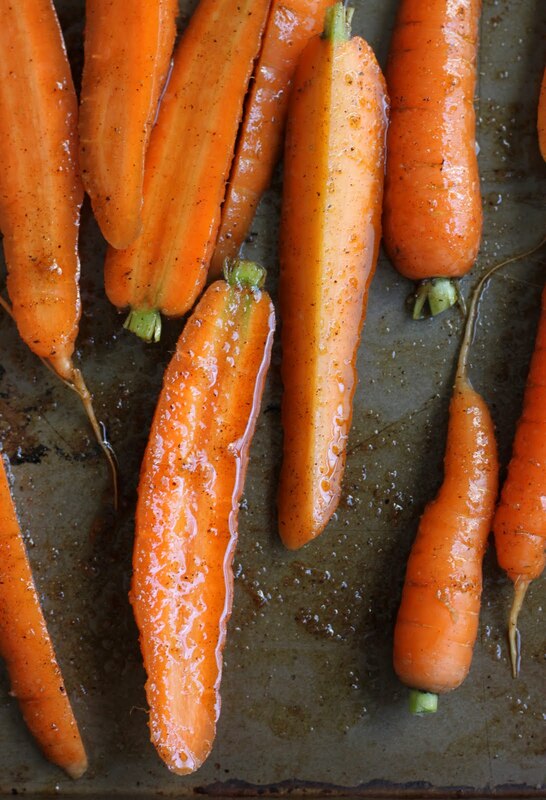 These carrots - and your photos - look wonderful! I actually stopped by your blog because I loved the name - very clever! I'll be 'following' you in future! Carrots and Middle Eastern flavours just seem like they were made for each other... I can never resist a recipe that combines the two! I just harvested a lot of creme colored and red carrots. I must try this! I love roasted carrots! I discovered them only recently, so I am happy to experiment with new recipes and this one looks great! What a lovely post--those carrots look absolutely gorgeous. Something about simplicity that makes the most humble veggies come alive. I love the color on them. Loved your blog! Mmmmm, I love spice mixes like that--I'll have to try Baharat. I made a Moraccan stew last year that had similar spices in it and I've been craving it (even in the summer heat). Bharat!!!! Its another name of india in its native language hindi..
شركة مكافحة حشرات بالمدينة المنورة وعدم تواجدها مره اخري مكافحة الحشرات بالمدينة المنورة فالخبره عنواننا والتفوق دليلنا . عناية ميكانيكية : عن طريق استخدام مكانس المياه و الخراطيم النفاسة لإزالة الرواسب و البكتريا . عندما يتواجد فتحة مناسبة يستطيع العمال الدخول إلى الخزان و تنظيفه جيدا من الداخل باستخدام فرشاة خشنة ثم ملأ المياه و تفريغها للتأكد من نظافته و في حالة الخزانات الصغيرة يتم الاكتفاء بتوجيه مكانس المياه أو مضخاتها إلى داخل الخزان لإزالة الأوساخ و الترسبات ثم ملأ و تفريغ المياه عدة مرات للتأكد من نظافته . نقل عفش بالمدينة المنورة من افضل الشركات المقدمه لخدمة نقل وتخزين العفش والأثاث بالمدينة المنورة فنحن نمتلك طاقما من النجارين الماهرين الذين يقومون بفك وتركيب العفش والاثاث دون تجريح او خدوش او كسور مما جعلنا مميزون فى مجال نقل العفش والاثاث بالمدية المنورة كما يوجد عندنا مستودعات امته لتخزين العفش والاثاث وادوات المطبخ ولدينا طاقم فنى لتغليف العفش والاثاث والحافظ عليه من الاتربه. شركة المشرق كلين لنقل العفش والأثاث بالمدينة المنورةتقدم الكثير منخدمات نقل العفش والأثاث ، لدي الشركة طاقم عمل متخصص في مجال تغليف ونقل العفش والأثاث بدون أي تجريح أو كسور أو شروخ لا قدر الله، فريق الشركة مدرب ومنظم جداً ويعمل في هذا المجال منذ زمنٍ بعيد، مختصون في فك وتركيب العفش والأثاث أيضاً بكفاءة وإحترافية عالية، بجودة عالية وإحترافية لا مثيل لها وبأسعار منخفضة جداً.